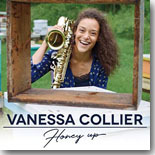 If you haven't yet hooked onto the Vanessa Collier bandwagon, do so now because this young woman's a rising star. You'll hear plenty of her soulful vocals, hot sax playing and creative songwriting on her third album, Honey Up, this month's Pick Hit. We feature still another very young artist in this month's Surprise CD, with Houston's blues/rock guitar prodigy Ally Venable's latest CD, Puppet Show. This month's Flashback feature takes a look at some classic Orleans recordings from guitarist Little Freddie King. Our What's New section features new CDs from Shemekia Copeland, Mike Zito, Mark Hummel, Gerry Jablonski and the Electric Band, Blind Lemon Pledge, Steve Dawson, Kara Grainger, The Lucky Losers, Dana Fuchs, John Clifton, Little Boys Blue, Willie Jackson, and more.